Premium, high-quality USB 3.0 HDD Enclosure and Hub. High quality accessories, affordable prices. 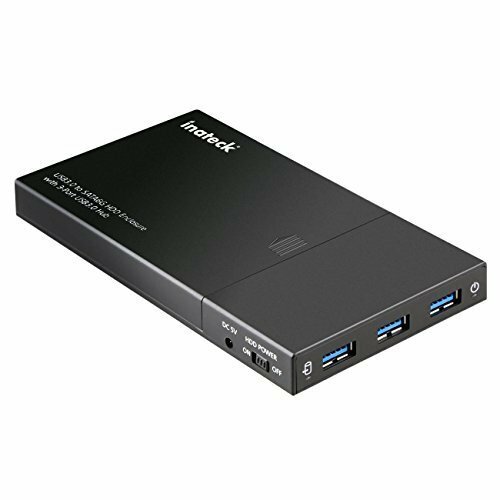 Combining a USB 3.0 SATA HDD/ SSD enclosure with a 3 port USB 3.0 hub, Inateck's FE2007 allows users to significantly increase their devices data storage space and connect multiple external devices simultaneously. USB 3.0 supports backward compatibility for USB 2.0/ 1.1. Performs SuperSpeed data transfers that are up to 70% faster than conventional USB 3.0*, including rates of up to 3Tb and 5Gps. When paired with UASP-enabled devices. The UASP Transfer Protocol only can accelerate the read write speed of the SSD hard drive. Lightweight (81g), compact dimensions (145mm×80mm×15mm), tested ABS plastic and built-in foam pad protection come together in a sleek, aesthetically pleasing design. -SuperSpeed performs best when paired with UASP-enabled devices. The UASP Transfer Protocol accelerates the read & write speed of the SSD harddrive. -If a power shortage occurs when connected to a high power-consumption device, please use a USB charger with the included USB-DC (DC5V 3.5mm*1.35mm) . -HDD power button only controls the power supply of this enclosure and has no effect on the USB ports. Quality: Combines a fantastic ASM1153E+ASM1074 chipset, USB 3.0 transfer speeds of up to 5Gbps and downward USB 2.0/1.1 compatibility with tested ABS plastic material, built in foam-pad protection and a modern, aesthetically pleasing design. Convenience: Enjoy digital freedom by turning your 9.5mm or 7mm 2.5-Inch SATA HDD/SSDs into an external hard drive; supports hot-swapping, as well as plug & play. Sustainability: An automatic sleep mode function allows you to save power effortlessly, while single touch activation allows you to pick up where you left off in an instant. Easy-to-Use: Simple, tool-free installation and disassembly; no reboot or additional drivers required. Compatibility: Works great with all versions of Windows and Mac OS.